OptiMelt provides a fast and accurate means of automatically determining the melting points and melting ranges of chemical substances. With microprocessor-controlled temperature ramping, a built-in digital camera, and a selling price that is half that of competing models, OptiMelt offers the best value of any commercially available melting point apparatus. 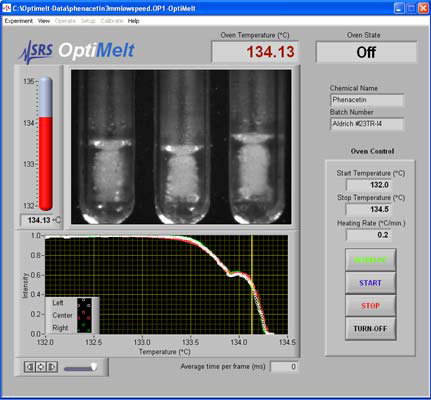 OptiMelt provides a fast and accurate means of automatically determining pthe melting points and melting ranges of chemical substances. With pmicroprocessor-controlled temperature ramping, a built-in digital camera, and a selling price that is half that of competing models, OptiMelt offers the best value of any commercially available melting point apparatus. OptiMelt has an intuitive front panel and is very easy to use. 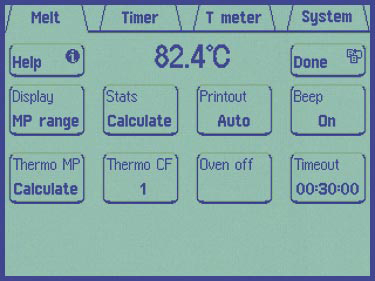 Simply select a start temperature, ramp rate, stop temperature, and hit start. Results can be easily seen from across the lab on the large LCD display. Samples can be viewed on the front panel through a removable magnification lens. During a measurement, you can flag relevant events by pressing dedicated front-panel buttons. 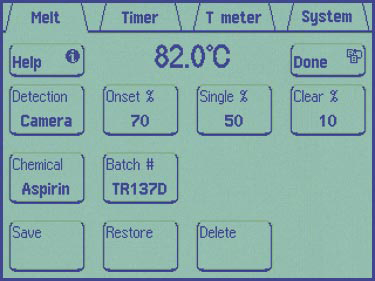 Up to six individual temperatures can be tagged for each sample. OptiMelt uses a platinum RTD sensor and makes temperature measurements to 400 °C with 0.1°C resolution. It is easily calibrated in the field against certified reference standards and complies date of the last calibration which is included in all reports. Unattended melting points, and melting point ranges determined by OptiMelt, closely match visual results. OptiMelts digital image processing algorithm provides a dramatic improvement over optical absorption or reflection techniques. The MeltView Window software displays live, high-resolution images of each sample during analysis.